Involved movement - Explosion processes. Perfection is achieved, not when there is nothing to add, but when there is nothing to remove. Completing a trilogy dedicated to breakthrough developments by unknown and unexplored Soviet engineer Alexei Ponurovsky, that can lead to revolutionary changes in the field of electricity generation, getting cold and the internal combustion engine designs with dramatically improved performance, I would like to suggest the idea of a simple engine-generator operating on new principles, with knowledge of Ponurovsky and beyond. In the first article, "Cold Rotor" the author has proposed the new version of application of the physical laws - explosive, cost-free decomposition of water into hydrogen-oxygen mixture with release of cold and energy. "The discovery of the century", the explosive dissociation of the different temperatures substances at heterogeneous state will help us to overcome all the energy, environmental and economic problems of mankind. The second article, “Russian Diesel”, explains the essence of another, no less surprising invention, coupled with the new interpretation of the combustion process, where the engine efficiency can be raised by an order, ignoring the puzzled classical science, which limits our desires for calorific capacities, and the thermodynamic formula, which ignores nature of matter and energy. The third article is intended to take the first practical step towards the new technology of explosive dissociation. By proposing an interesting idea and a simple check of a new phenomenon, I hope to awaken the minds and channel the energy of young scientists and engineers for the implementation of the project. We will try to combine in the single device the process of the explosive vaporization by inter-reacting the superheated oil and cold water (Invention of Ladislao), an ultra-efficient combustion and pulsating centrifugal turbine. The wheel, being a unique mechanism, is designed to combine the energy and movement – which is so obvious. But where is the perfect design that will roll out the technical machine mankind on a flat and fast road?! While looking for the right solution, I have studied to best of my ability and talent all that spins, moves, burns and explodes. It turned out that the process is not entertaining only, but also productive. In the course of the investigations I had to work hard and have brushed up and reviewed a bunch of inventions and works of mainly Russian (Soviet) origin, which until nowadays represent useful scientific resources to "dig" the necessary in unlimited quantities. The first simple generator was built by someone called Heron of Alexandria, prolific inventor, who created many of the original devices. His wheel is a brilliant creation of engineering, where intuition and knowledge have combined power of steam and jet effect in a simple generator of mechanical energy. The principle of operation - the centrifugal movement of the working substance - which seems a very costly and illogical at first glance then was used in the so-called over-unity devices: the Shauberger & Mazenauer turbine, Klemm engine. Plainly, no one has scrutinized this over-unity, because we continue to use, in fact very modest in terms of efficiency, but more powerful machines - internal combustion engines and electric motors. Basically we produce electricity in a not very aesthetically pleasing way, but in very pragmatic - thermal power stations (fuel combustion), hydro (energy of water motion) and nuclear plants (energy of the substance). Further development of technology offers solar energy, which is gaining momentum due to its universal availability and environmental essence. Regarding the possibility of the centrifugal turbines to operate without fuel, there is a great, short and specific article of the next ordinary Soviet engineer Puzanov, but the main theme in our case is not a cost-free mode. The idea of this article is the revelation of another phenomenon – the energy of explosive processes and the possibility of using these in the national economy. The combination of these parameters, after proper experimental verification, will allow application of the device in smaller generation and hybrid cars. The new principle to obtain and use energy. 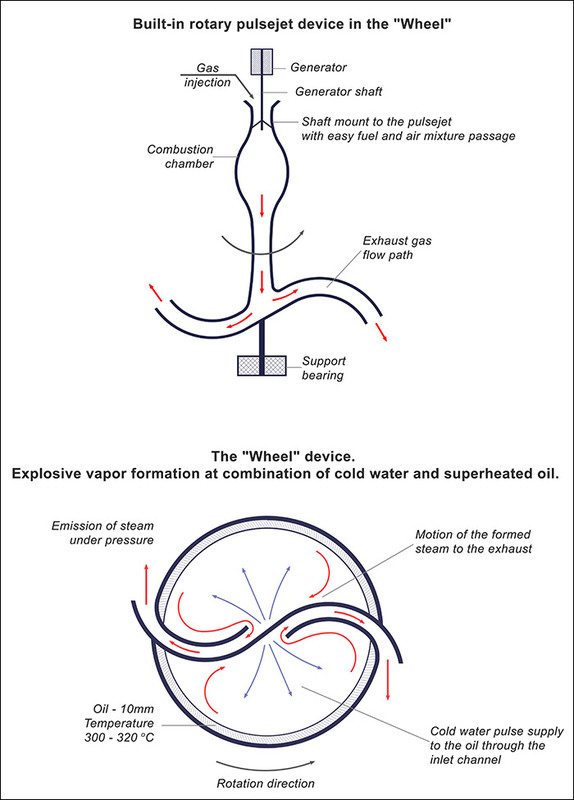 The explosive evaporation during atomization of cold water on the overheated oil and the consequent outflow of high pressure substance from the wheel jets. The effect of the explosive interaction of superheated oil (at 300 degrees centigrade) with cold water can be checked by anyone, but one should be aware that this fire risk event. Some scientific studies over this phenomenon were conducted as well – by the respective inventions and patents are the evidence. But one fellow with a name sounding nice for a Russian ear: Ladislao, has bothered to measure the amount of heat and came to the conclusion that it is not the burning oil, because too miserly amount of it is consumed in relation to the resulting steam. And he did not go further, obviously unwilling to fight against the faith adopted by the concept of the inviolability of the second law of thermodynamics and hollow combustion theory with calorific fuel ability - hidden where no one knows. The deepest immersion into the problem was made by our friend Ponurovsky, who, in a series of his inventions, had fired from all guns at academic science. To resolve the question of the nature of the interaction of energy of substances at different temperatures one should look for his inventions: "Method for the regeneration of the exhaust gas and the device for its realization" and "Fridge". But our task is different - to offer easy-generating unit based on this new knowledge, and to prove its advantage over existing ones. Jet high-speed rotors of small diameter there are justifications that a centrifugal movement has over-unity nature. Puzanov. Pulsdzhet of Glukharev design. Ultra-efficient combustion due to the heating of fuel and injection system of supply of the fuel-air mixture. Built-in chamber to combine oil and water, where the over pressurized products of the explosive interaction revolve the turbine. We have a hollow metal mold in the form of flattened egg inside which two spaces are arranged. Forced pulsating burning propane in air occurs in the first camera – upper supply. In the second the reaction from combining water and oil takes place – lower water supply. Gas-vapor mixture enters the exhaust tract where, taking away heat from the body pulsejet, flows together with the exhaust through pulsejet nozzle. Thus, we are having a kind of two heat engines: the pulsating combustion and original and very economical steamer, the essence of which lies in dissociation at different temperatures and micro-detonation burning of superheated oil with atomic oxygen from decomposed water. When water injection happens - a gradual cooling of the oil occurs, and the explosive reaction stops at temperature below 220 degrees Centigrade, so maintaining the temperature – one of the conditions of device operation. "Fuel" is an oil almost of any condition - waste oil, cheap vegetable oils; rapeseed, palm, from the fast growing algae, optionally pyrolysis oil from solid waste and plastic, etc. The theoretical consumption of heat has to be smaller by 3 to 10 times. The data for mechanical energy is unavailable. The gas flow rate (very cheap and clean fuel) is minimal, mainly to maintain the temperature and pressure of the exhaust gas mixture. No lubrication, friction and no movable parts. No high-temperature and critical pressures. No consumables and short life parts. One of the drawbacks is high consumption of water, which is easy to make reversible through the cooling system. But for other tasks; such as heating, access to clean water or desalination - we get a new competitive advantage. I would like to recall: final exhaust is a pure mixture of water vapor, carbon dioxide and nitrogen. The device operates in the same manner as "cold rotor Adam", where in both cases the driving force is the explosive expansion of gases, but in one case from the cold separation and hydrogen-oxygen mixture; in the other - heat and water and steam mixture the with carbon dioxide. In both cases, atmospheric nitrogen is present. Getting Started - start of pulsejet under natural pressure of liquid propane, heating and spin up of the system under the influence of the jet exhaust and then, batch fed of water-air mixture in the oil located in the cavity of the device. The explosive vaporization with increasing pressure (up to 300 atmospheres) allows you to work in a mode of expansion steam engine type. The versatility of construction lies in the possibility of using the device coupled to any heat source. To do this, you need to give up the pulsating combustion and direct the hot gases to the pulsejet input. 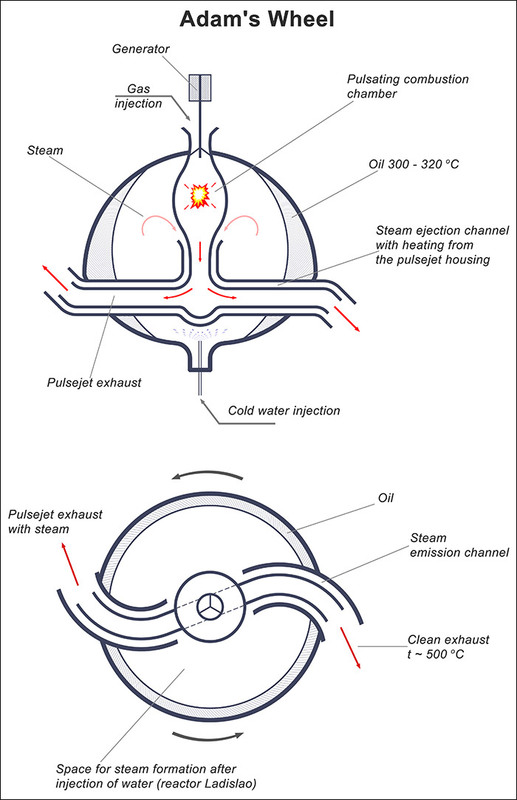 The suction effect occurs at a centrifugal expiry and has a positive effect on the work of all thermal devices ranging from simple furnace to combustion engines and turbines - power increases, efficiency improves, and harmful emissions reduce due to better filling of the combustion chambers and the purification of the products of combustion. For many home engineers it will be interesting to view a simplified scheme (without oil - water only) of the application of the wheel paired with a conventional stove on wood or coal. 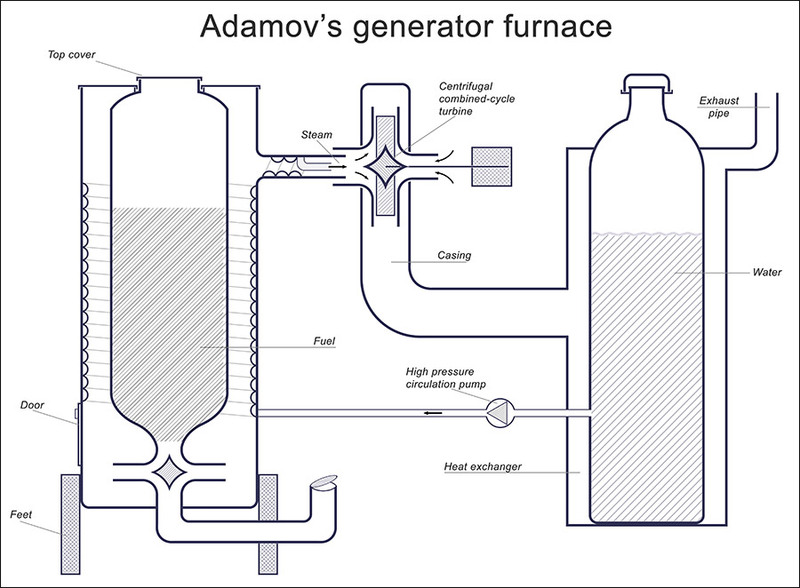 The figure shows a version of the scrap home oven (you can burn waste together with wood and coal) with the functions of energy generation and hot water production. With rotations increasing we arrive at another property which opens new horizons for application (in particular in the unmanned aerial devices): the storage of energy in a form of rotational kinetic energy. The idea of a super flywheel by Nurbeya Gulia is waiting for the hour to come. The simplicity and small size. The high-frequency pulsing combustion and tamed explosive reaction (terminology by Ponurovsky) can be easily arranged in a small (according to the requirement for flywheel systems) and the extremely low-maintenance device, being at the same time both high-tech and simple. Both processes; pulsating combustion and explosive evaporation, are very stable and easy to manage. In the presence of gas (or petrol), the system works always, which excludes a misunderstanding as the dead batteries in the middle of the road in the cold. Gas is inexhaustible and oil is a renewable resource, so it is easier to have a mobile generating universal device, rather than to fool with pseudopure electric cars. Such affordable and practical hybrid generator is very urgently needed in our harsh Russian conditions. Generation of a huge amount of heat and highly efficient energy production will allow carrying out a daring leap into the ideology of alternative affordable energy and transport, thus, turning priorities - not a machine picks up the energy from the network, but quite the opposite way. Each vehicle, being a universal generator of heat energy and clean water, creates a new distributed infrastructure of use, without the risk of technological accidents and the avoiding loads on the environment. 1. Gather a group of like-minded people, to find the means and to give out a working copy in a short time. 2. Check the parameters of the explosive interaction of hot oil with cold water on the subject of "over unity" in the appropriately equipped laboratories – to make a scientific survey on the nature of this phenomenon and the degree of kinship with the Ponurovsky inventions describing an explosive dissociation processes of cold water when combined with the hot gaseous medium. 3. After scientific justification of explosive dissociation of water at different temperatures combining with other substances, to open a new environmentally perfect and economical technology in the production of heat, cold, energy and clean water. Our small team has conducted a scope of work in the study and application of new technologies, we are ready to complete the job, and it requires a union of specialists in different fields. We are ready to start with the more utilitarian models designed for use as a co-generation system for housing and communal services - the task is easier there, and has clearer goals. Such systems – microturbines – already exist, but are substantially expensive. Our installation, being a native Russian technology, will be cheaper and more reliable. The design will be different from "Wheels" by a stationary system of pulsating combustion with a very high temperature and some "know -how", which we already have. P.S. Article idea was born a long time ago rooting into the stress that had followed the announcement that the "E - Mobile" project is closed. From the surge of emotion I have suffered and I issued a smashing title, where proletarian anger was concentrated - "Amba Emobu or how Prokhorov has ruined project. Satiety begets arrogance. Kirdyk project – Ek dream." As time passed, passions subsided, but the bitterness of defeat has remained. The proposed rematch project will feature statesmen against salesmen. I am sure that a small group of Russian engineers with a very modest budget, in the short term, will offer both a concept and working models of Russian cars on the basis of domestic technologies and complying with local conditions. It is sufficient to collect a bunch of our talents, create the state (goal) programme and assign a responsible person (responsible by his head). And if you think it's from the distant past - that's not true, and would bet on your terms - we are cooler. It remains the case for small - to find out the coordinates of the central office of "Statesman". Adamov Armen, Moscow - Yerevan. January 2017. 1. Ladislao. A method and apparatus for producing thermal energy. 2. Ponurovsky. Exhaust gas recovery method and device for its realization. 3. Puzanov. The energy of the centrifugal forces of inertia. 4. Glukharev. Pioneer helicopter building. 6. Micro-turbines. Scientific-Technical Center "Microturbine technology». 7. Adamov. The use of pulsating combustion in waste treatment plants.